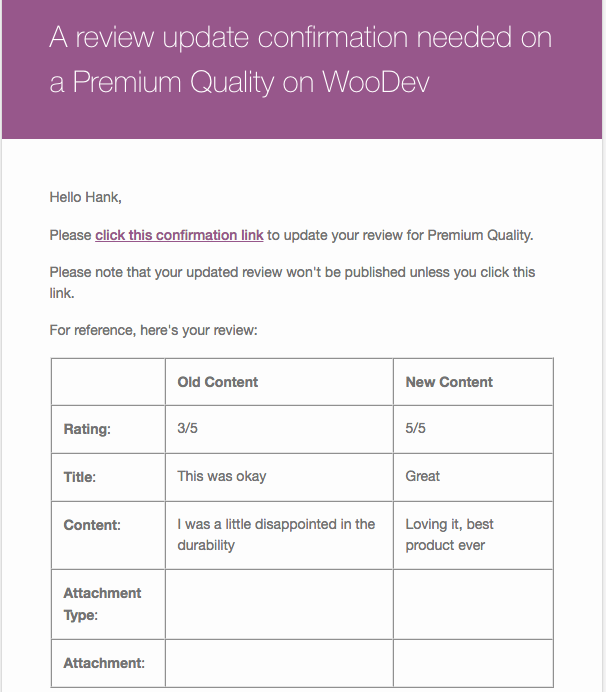 WooCommerce Product Reviews Pro was updated to version 1.8 last week, which adds a couple of highly-requested features to make your product reviews even more seamless. As of this version, customers can now update previous reviews, and guests can watch threads to be notified of replies! 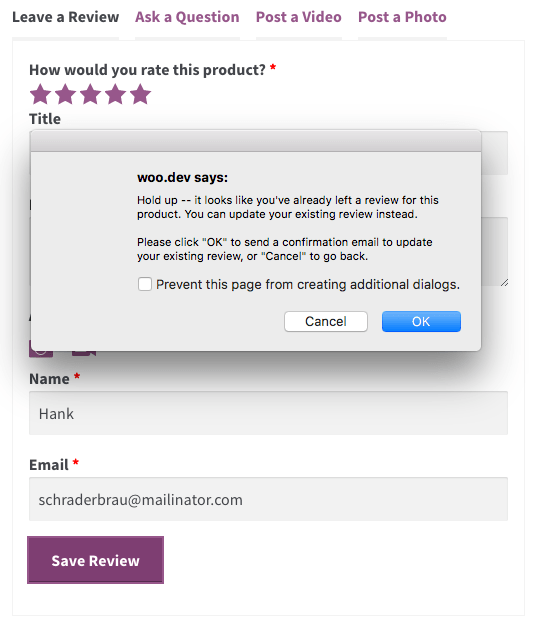 In previous versions of Product Reviews Pro, only logged-in customers on your site could “watch” a review, question, or other contribution to be notified of replies. This is especially helpful if you allow “question” contributions so customers know when a reply has been made. 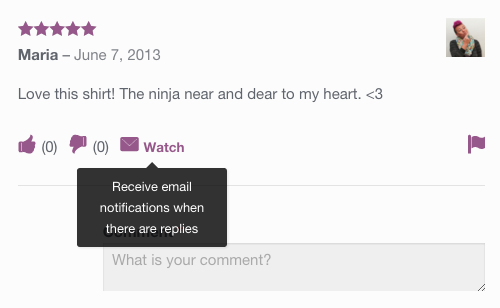 Thread watching can be enabled or disabled by enabling or disabling the “Contribution reply” email. 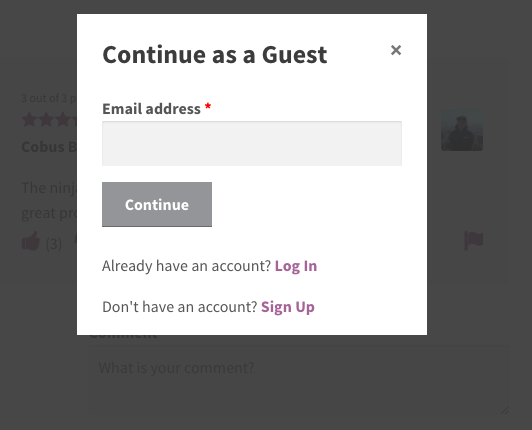 However, now if this is enabled, thread watching will be available for guest customers on your site as well! When clicking the “Watch” icon, a guest user can now “Continue as guest” to watch the thread. This will allow the user to enter an email address to get contribution replies sent to them. Product reviews with WooCommerce are stored as WordPress comments. While a comment is a good choice for storing an managing reviews (as a review has the same components and behavior of a comment for the most part), this introduces one problematic flaw for product reviews: just as customers can leave more than one comment on a blog post, they can leave more than one product review. While adding multiple comments makes sense, adding multiple reviews for a product does not. 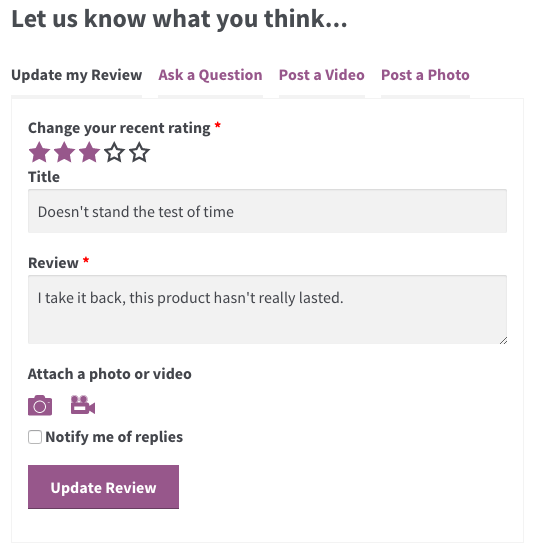 Version 1.8 of Product Reviews Pro will disable this behavior, either blocking multiple reviews, or even better, prompting customers to update previous review content instead of leaving a new review. 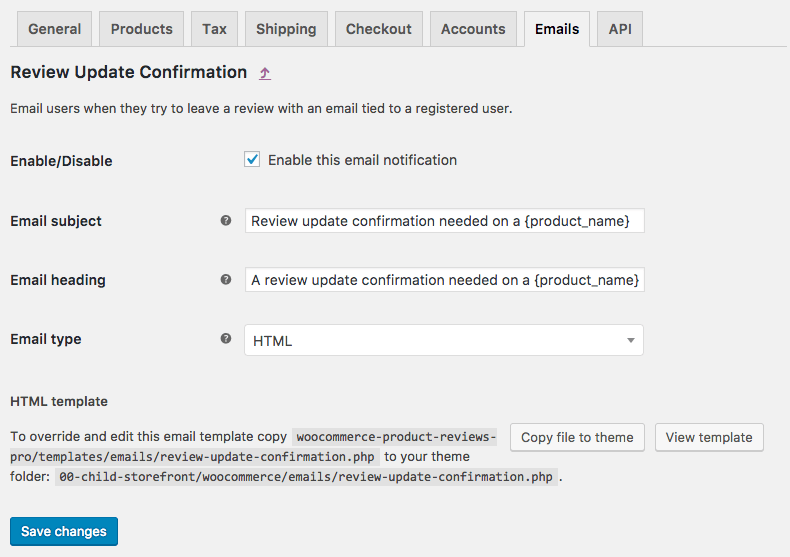 By default, when upgrading to version 1.8.0, the “Review update confirmation” email will be enabled for your store. This controls whether customers can update previous reviews or not. If you disable this setting, logged in users will not be able to update a review when viewing a product. 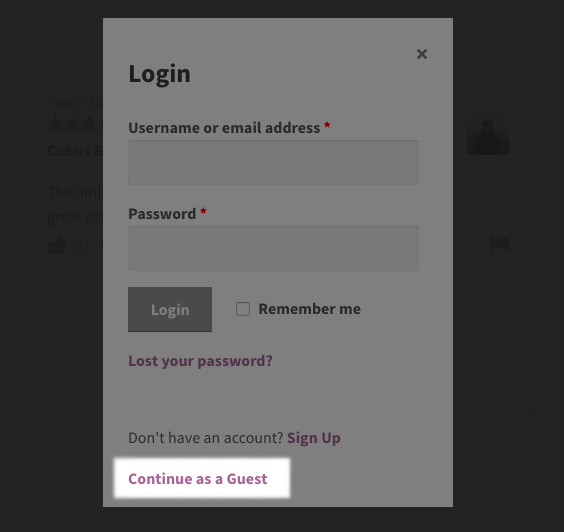 If a guest or logged-out user tries to add a review with the same email address, they’ll also be blocked from adding a new review. However, we recommend leaving this setting and email enabled 🙂 Here’s what will happen if you let users update existing reviews. When a logged-in customer visits a product page where they’ve already left a review, they’ll see a new form — “Update Review”. If they click a star rating to change their review, this is pre-filled with the previous review content, letting them make adjustment and re-submit the review. If you moderate reviews, this will re-submit the review as an “unapproved” review so store managers can see the updated content first. While viewing the list of contributions for a product, customers can also click “Edit” for reviews they’ve left to scroll back up to this form and open, providing easy review editing. For guest or logged out customers, the email submitted with the review is now checked for a previous review before submitting it. If this email address has already left a product review, the customer can still update the review. However, we need to be sure this is the same user, so these updates must be confirmed via email. If customers choose to update the review, they’ll receive a confirmation email with the old and new review content, along with the confirmation link to update the review. If the confirmation link is used, the new content will replace the old review content, and the updated review can be again held for moderation so you can review it. 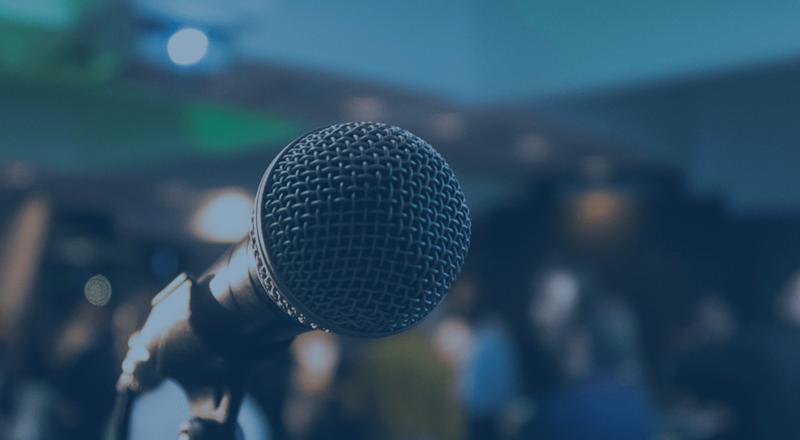 Both of these new features are designed to make your product reviews and other contributions more functional for all customers, helping them get notified of replies while also ensuring your product reviews are accurate and avoid duplication. Thanks for the great plugin! Is there a way to limit the number of reviews that show or load at once, with an option or button to view more reviews? So, if there are a lot of reviews, they don’t load/show all at once.